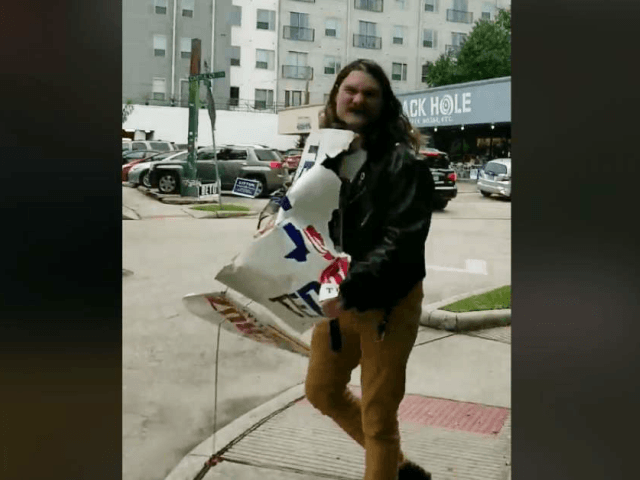 The viral video, which has gained more than 671,000 views on Facebook as of Thursday afternoon, shows an unidentified man uprooting Cruz for Senate yard signs in the Montrose neighborhood of Houston and tearing them apart before yelling how he hated the Texas Republican. The encounter began when homeowner Alfred Ramos, who filmed the video, noticed the man reaching for one of his yard signs. “It is your property? Okay,” the man said, leaving the sign alone, before going across the street and asking if that sign was also on Ramos’ property. “That’s my neighbor’s property. He’s a gun owner,” Ramos replied. The man then began ripping up the signs he had in his hand before turning around and yelling at the camera. “I hate Ted Cruz! I hate Ted Cruz!” the man yelled in a demonic sounding voice. This is not the only instance where left-wing protesters have torn up yard signs for GOP candidates and organizations. One Wednesday evening tweet showed two unidentified individuals caught on surveillance footage stealing Cruz signs in a Texas park, and a professor at UNC Asheville who allegedly stole a political sign for a local conservative political action committee was arrested this month and charged with a misdemeanor.